I love pickles, always have, and I can tell you that its way better to love a pickle, than be in a pickle. One of my all time favorites is a pickle and cheese sandwich, with either a vinegar type pickle, or something sweeter such as, bread and butter pickles. The food version of a pickle, is definitely an easier, as well as more delish, quandary to work your way of out, than life pickles. 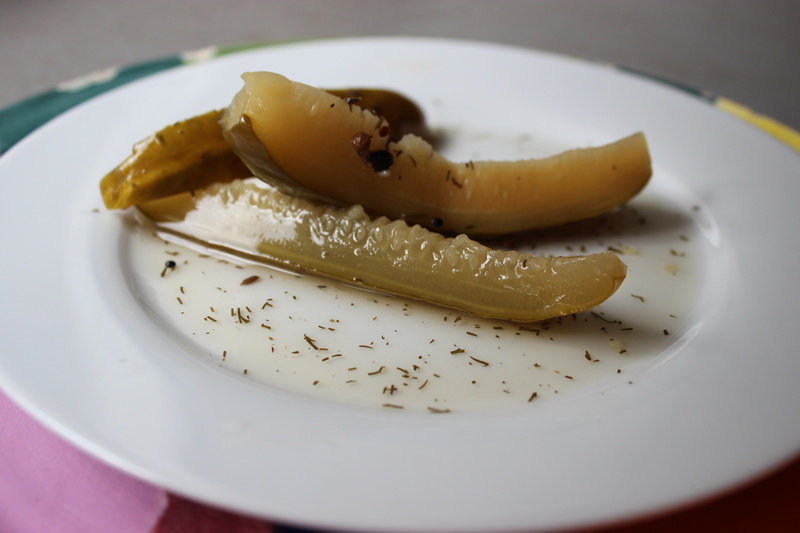 When it all comes down to it though, being in a pickle in life, or eating a pickle, can be sweet, sour like the briny deep, while others bite back with the tartness of vinegar. 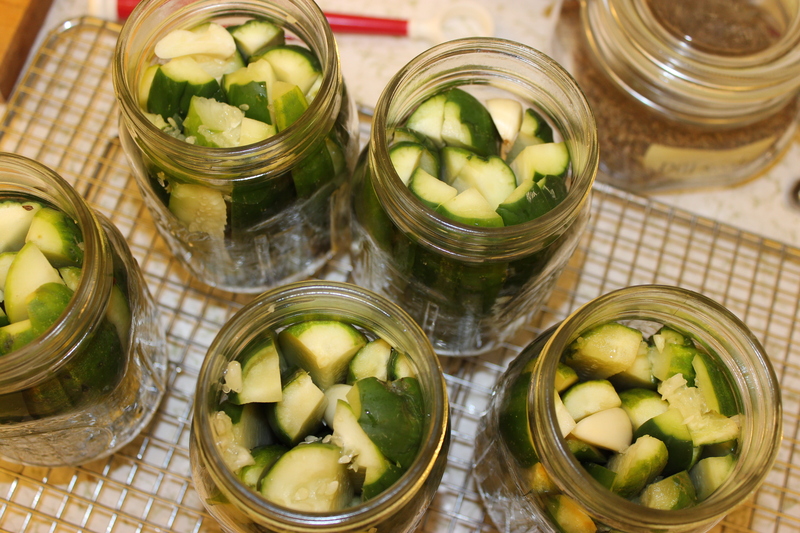 Yes, I am still binge canning, and I don’t for see that stopping any time soon. However, I am beginning wonder, if breathing in so many vinegar fumes is healthy? So far I have pickled carrots, cucumbers, watermelon rind, and asparagus. The latter did not end well, let’s just say that water is an ingredient, and without fail it does belong in the list of ingredients. I have also jarred up some red pear jams, blackberry preserves, sauced it up with an apple cider glaze, and strawberry vanilla syrup. There will be more, no doubt, a lot more. Next up will be half sour pickles, a completely different technique. 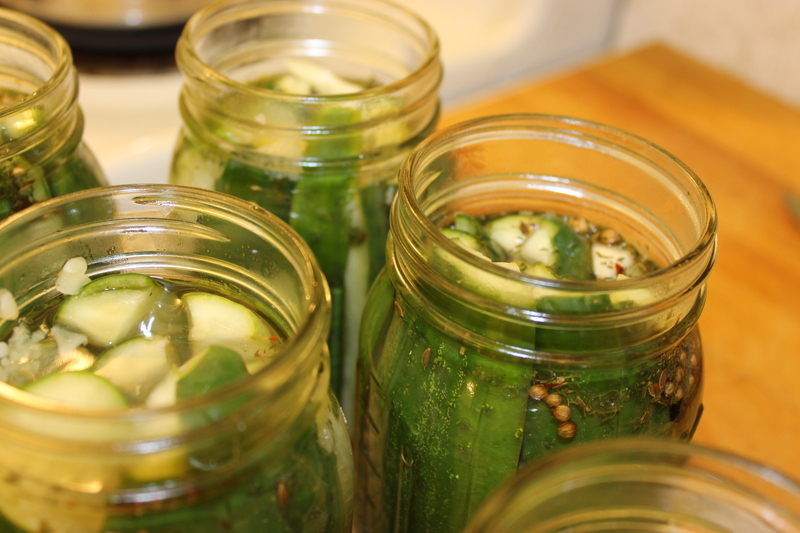 Making sour pickles uses a brine, which is another fancy word for salt water. Speaking of salt water, no two salts are alike in the canning world. There is such a thing as canning/pickling salt, this salt is free of anti-caking agents. The anti-caking agents, can turn your pickles or other items a brownish color. So now, not only do I have about eight different types of flour in the fridge, I have kosher salt, canning/pickling salt, sea salt both coarse and fine, as well as Maldon finishing salt. These pickles are amazing, honestly, I surprised myself. On my pickling quest, there wasn’t really a packaged pickling spice I liked, so I made my own pickling spice Using a shorter processing time than normal, helped retain a great crunch. They do bite back a little at first, however, I like that in a dill pickle. 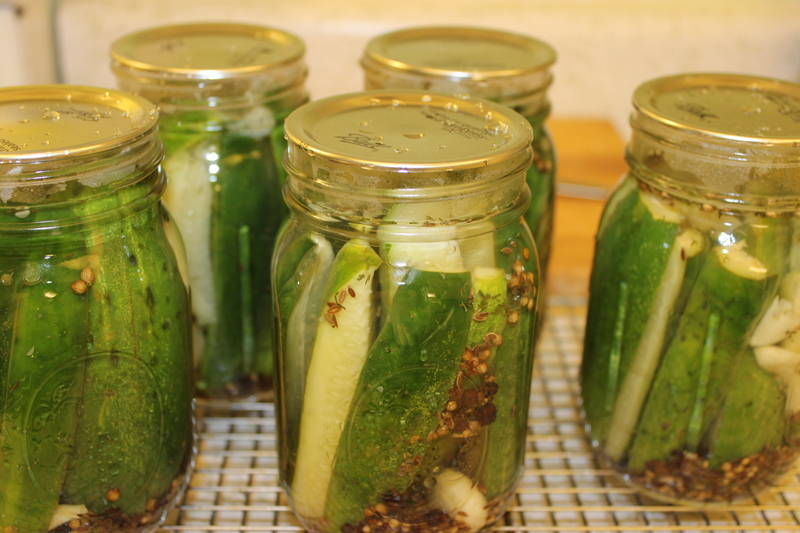 I used pickling cucumbers, the smallest Kirby pickles I could find, which is the secret behind the crunch. The size of cucumbers I used for these spears, would have been fine as whole pickles. When you are cutting them into spears, be sure they are not too long. Take a slice off both ends, check the length in a jar, use that one as your guide. You will need to leave 3/4 of an inch of head space. The number of jars you end up with can vary, prepare an extra jar and lid, if you think you may need more. Even though you have warmed the lid, it can be used at a later time, if ends up being an extra. Lids, after being processed in the bath with a jar on, cannot be used again. The rubber seal will not hold correctly. Just a few things extra, sterilize the jars, in the water they will be processed in. Place the jars in the stockpot, cover with water, bring to boil while prepping all the other ingredients. This one step process, saves a bit of energy, as well as the temperature in the kitchen. My Grandma canned like a champion, all summer, no air conditioning, drinking black coffee all day! Me, not so much, the AC cranking, ice tea flowing. Once you are ready to start filling the jars, lift them from the pot, pouring any water in jar back in to pot. The few drops of water will evaporate from the jars quickly, yet remain hot and sterile as you begin the filling process. Capping the jars, after the lids are on, twist rings onto jars, gently enough that they hold, but tight enough they don’t pop off. You should be able to twist them off with just your fingertips. Place into prepared water bath, when water boils again, that is when the time starts. After processing, carefully remove from bath, place onto cooling rack or towel on the counter. The jars should begin to ping within a few minutes, a slight indentation in the lid should appear, but may take as long as 45 minutes, or more. Test the seal after 24 hrs, to do this remove the ring, holding the jar by the rim, lift the jar up a few inches, if the seal holds, success you have processed correctly. If it separates from the jar, refrigerate, and eat within 2 weeks. 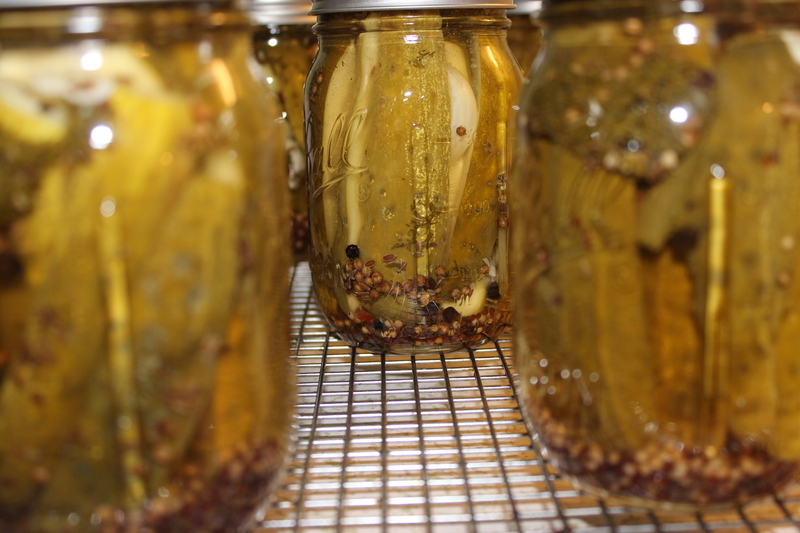 Properly sealed jars, should be stored in a cool, dark place, for up to year…if they last that long. In a stockpot large enough for 5 pints jars, add water filling jars and covering them, bring to boil. 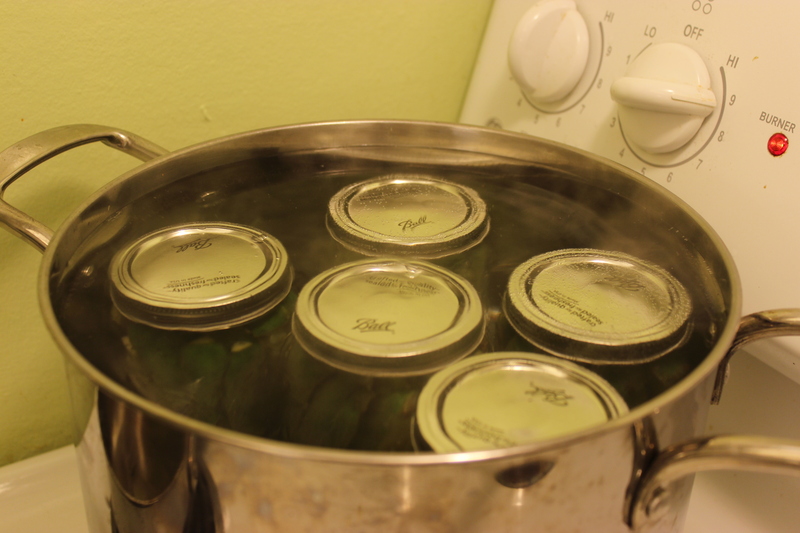 This serves two purposes, prepping your hot water bath, and sterilizing your jars. 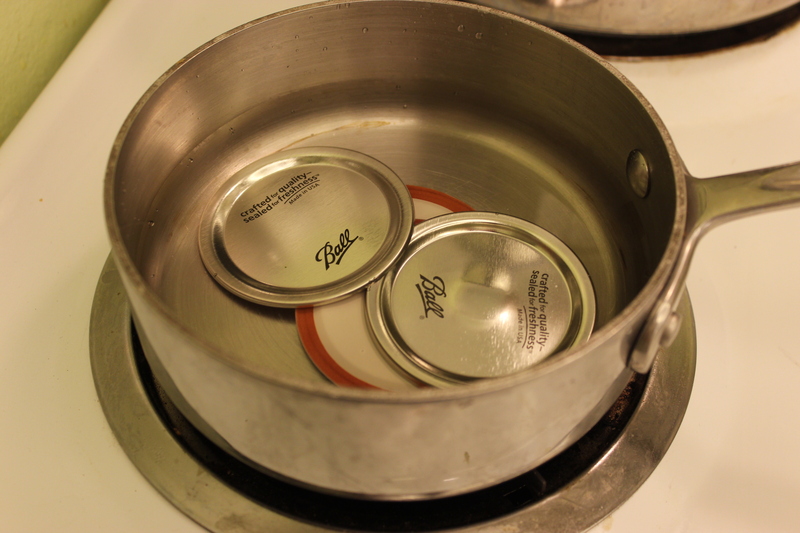 In small pan cover lids with water bring to a simmer. In large pan mix vinegar, water, and pickling salt, and bring to boil. Prepare cucumbers, be sure to check the fit, cut a few, test the fit in a jar, then use as a cutting guide. 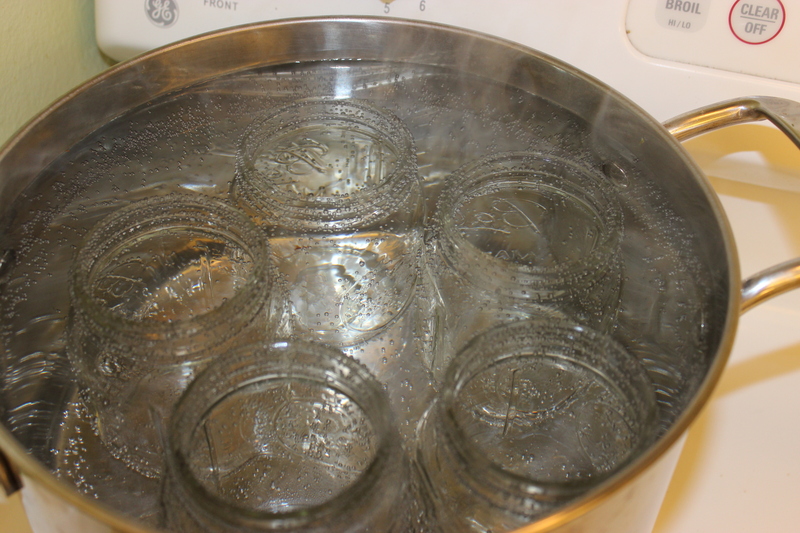 Remove jars from boiling water, empty water back into pot. 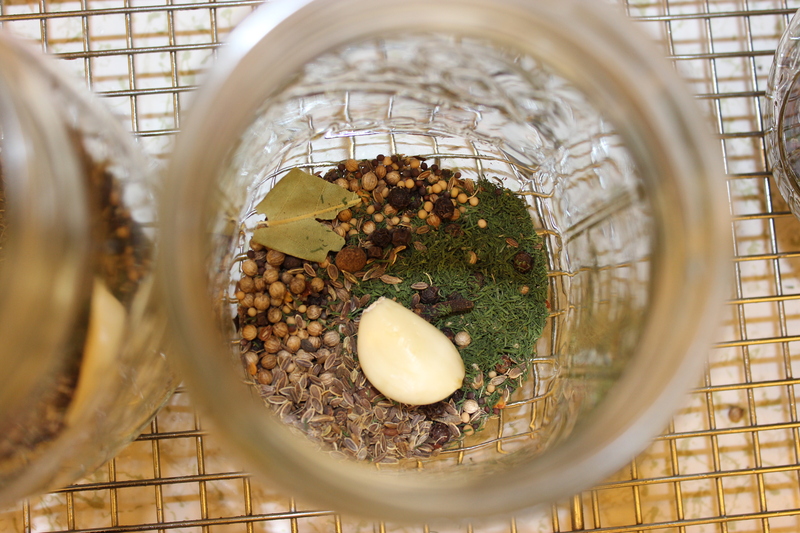 Into each jar add 1 tbl pickling spice, ½ tsp dill weed, ½ tsp dill seed, and 2 cloves of garlic. Pack spears tightly into jar, place 1 clove of garlic into the middle of the spears. 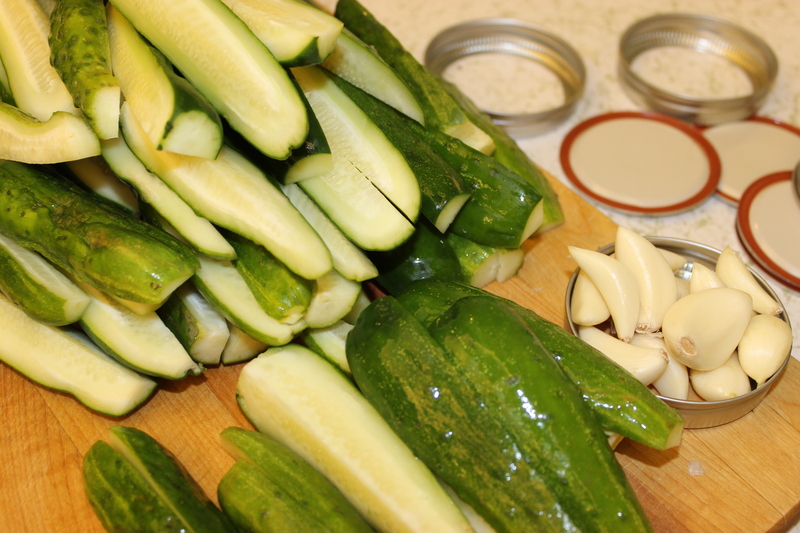 Pour vinegar mixture over cucumbers, leaving ½ inch head space, top with lids. Twist rings onto jars, gently enough that they hold, but tight enough they don’t pop off. You should be able to twist them off with just your fingertips. Place into prepared water bath, adding or subtracting water, jars should be covered with almost 2 inches of water, when water boils again, start the timer, 7 minutes. remove from bath, onto cooking rack or towel on the counter. The jars should begin to ping within a few minutes, this creates a slight indentation in the lid, it may take as long as 45 minutes, or more. Test the seal after 24 hrs, to do this remove the ring, holding the jar by the rim, lift the jar up a few inches, if the seal holds, success you have processed correctly. If it the seal breaks, refrigerate, and eat within 2 weeks. Properly sealed jars can be stored in a cool, dark location for up to a year. 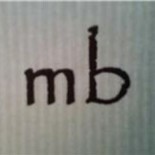 This entry was posted on August 9, 2015 by mb in Appetizers & Snacks, Canning & Pickling, Coffee Klatch, Sandwiches, Sides, Vegetables and tagged brine, canning, Etc..., food, life, sandwiches, Sides, vegetables.